In South Carolina, Clemson-South Carolina trumps everything else. The final Saturday of the college football season features a ton of great rivalry matchups. Whether they usually decide division titles (Michigan-Ohio State), determine state bragging rights (Georgia-Georgia Tech) or perhaps both (usually, Alabama-Auburn), there is no shortage of exciting games to watch the Saturday after Thanksgiving. But in South Carolina, Clemson-South Carolina trumps everything else. The Clemson Tigers have won four straight against archrival South Carolina seven separate times since the two foes started meeting in 1896. But for just the second time in the 122-year series, Clemson can record a five-game winning streak versus South Carolina with a victory this weekend. Ironically, Clemson’s recent dominance comes on the heels of South Carolina winning five straight against the Tigers from 2009-13, which is the Gamecocks’ longest winning streak of the series. Former South Carolina coach Steve Spurrier started that win streak in Dabo Swinney’s first season. Swinney finally beat the Gamecocks for the first time in 2014, and with another victory this weekend, Swinney would improve his record in South Carolina’s biggest rivalry to an even 5-5. After beating South Carolina three of the last four times, Clemson has earned a spot in the College Football Playoffs. But this rivalry is so big, beating the Gamecocks is arguably more important than even a bid into college football’s coveted Top Four on Selection Sunday. The Clemson-South Carolina matchup was so important to former Tigers quarterback Deshaun Watson, he played the game with a torn ACL in 2014. Despite his early troubles against South Carolina, Swinney has arguably led Clemson through its most dominating stretch against its archrival. The longest winning streak in the series for Clemson is seven games, which occurred from 1934-1940. During that time, the Tigers posted a 23.86 average margin of victory. But in the last four years, Clemson has beaten South Carolina by an average of 24 points per game. During the last meeting at Clemson two years ago, it was a complete rout, as the Tigers won, 56-7. That result was just two points shy of the second-largest margin of victory in the series -- the largest was when the Tigers won 51-0 in 1900. It was a little bit closer on the scoreboard last season, but Clemson still ran away from the Gamecocks in Columbia, winning 34-10. Since the last time South Carolina defeated Clemson, Swinney has turned the Tigers into a perennial national contender, but the biggest difference between the two rivals has been quarterback play. During the winning streak, Deshaun Watson and Kelly Bryant have started behind center for the Tigers. It’s hard to top that duo -- which led Clemson to 44 wins from 2015-17. Trevor Lawrence will make his first start in the rivalry, and even as a freshman, he’s more than capable of continuing the success Watson and Bryant started in 2014 versus South Carolina. The Gamecocks, though, will have the more experienced signal caller Saturday in Jake Bentley. However, Bentley has really struggled in two games against the Tigers. He’s completed just 50 percent of his passes for 167 yards, averaging only 3.6 yards per attempt, one touchdown and three interceptions. He will have to be much better in order for South Carolina to prevent Clemson from extending its winning streak in the series to five. But don’t count on it. 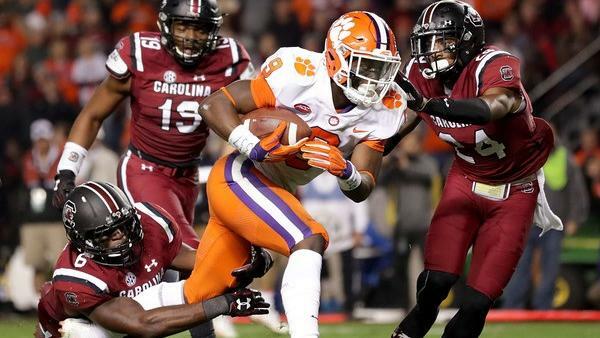 As Swinney’s national powerhouse program continues its journey into uncharted territory, Clemson’s dominance of South Carolina doesn’t appear to be ending anytime soon.